It's hard to pinpoint where it all really started for me. I learned to love nature, plants, and animals from my mother. Then, on my way to college, I drove past a beautiful rolling pasture filled with cows in Barry County--and I knew it was the kind of place I wanted to live. After graduating from Albion College, I returned to Western Michigan University to complete my agriculture degree. I loved it, but was also frightened by what I learned about food production. I started researching organics and pasture systems and eventually found my way to the work of Joel Salatin on his farm, Polyface. I took some workshops that he offered and knew that I wanted to incorporate some of his methods into my own farm, which I bought in 1996. I've been here farming, rehabilitating the buildings and the land, and continually learning ever since. When I walk out into the fields these days and see them teeming with earthworms, it gives me the shivers to think about how far this farm has come in 15 years. Working to restore the health of the soil while providing animals with the happiest, healthiest lives possible is my life goal. Who would have ever thought after retiring from a fulfilling career teaching high school English and music, I would find myself working as hard as ever on a very small, sustainable farm? It all started with a little book, Why Grassfed is Best by Jo Robinson. Jill handed it to me in church one day, trying to convince me I could eat meat from her farm and not worry about cholesterol. As life would have it, I became a volunteer and eventually a resident owner/farmer on this picturesque, humane, "little house on the prairie" farm. 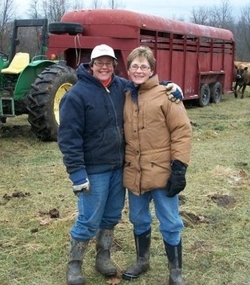 Together, we continue to grow the animals and our business, providing clean, healthy, delicious meat, poultry, and eggs to a growing number of concerned folks who “know enough to eat the very best.” We are on a journey, and for me, life is beyond what I ever imagined ~ a legacy I hope to leave to my children and grandchildren. We are fortunate and very grateful to have a whole community of family and friends who frequently take time out of their own lives to come help us work on projects to improve our farm.Thank you!